At 10:34 a rolling takeoff was commenced. The co-pilot, who was piloting the aircraft, increased the power to 1.5 EPR after which the engineer set the engines at maximum power. The aircraft accelerated normally but at a speed of slightly under 120 kt (as reported by the co-pilot) heavy vibration was experienced. The vibration increased in severity and the co-pilot decided to discontinue the takeoff. He called "abort", closed the power levers, applied maximum symmetrical braking and selected the spoilers. The abort action was stated to have been taken promptly except that there was a delay of 4-5 sec in applying reverse thrust which was then used at full power throughout the remainder of the aircraft's travel. 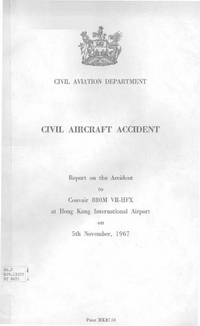 All four engines separated on impact with, the sea, the nose of the aircraft was smashed in and the fuselage above floor level between the flight deck and the leading edge of the wing was fractured in two places. The aircraft spun to the right and came to rest some 400 ft from the seawall. PROBABLE CAUSE: "I) Loss of directional control developing from separation of the right nosewheeltread; II) Inability to stop within the normally adequate runway distance available due to use of differential braking, impaired performance and an increase in tail-wind component and aircraft weight over those used in calculating the aircraft's accelerate/stop performance." In order to detect partial malfunction of the braking system at an early stage, the temperature of an aircraft\'s wheels should be checked after each flight. Any wheel which is abnormally cool under the circumstances of the flight should be treated as suspect and subjected to detailed examination. Traffic staff should ensure that the quantity and size of hand baggage admitted to cabin areas is not such that the evacuation time for the aircraft is likely to be adversely affected. Traffic Management responsible for aircraft loading should introduce effective measures to prevent the incorrect weighing and recording of aircraft load, whether as the result of error or malpractice. Distance from Hong Kong-Kai Tak International Airport to Saigon-Tan Son Nhat International Airport as the crow flies is 1501 km (938 miles).